Anche i concorsi di architettura sono ben altro che neutrali, soprattutto se a sponsorizzarli sono la lobby dell’acciaio, in questo caso l'Istituto Americano di Costruzione in Acciaio (AISC) e l'Associazione Collegiale delle Scuole di Architettura (ACSA). Come avviene di solito in questo tipo di partenariati il prodotto della lobby è il materiale principale di costruzione. Nel caso specifico il prodotto è anche ampiamente promosso dall'ACSA in un paragrafo intitolato "Vantaggi dell'acciaio". Il concorso utilizza il bando come spazio pubblicitario, in alternativa alla pubblicità classica e fa leva sull’autorevolezza e l'apparente neutralità dell’ACSA. Queste modalità di pubblicità occulta sono note, anche se spesso volutamente ignorate, dai concorrenti. Come l’articolo del Funambolist (che riportiamo nel testo originale) spiega efficacemente, il concorso è assai più manipolativo e agghiacciante su un altro fronte. Sempre dal bando si apprende che 65,3 milioni di persone sono attualmente sfollate in tutto il mondo e che secondo le statistiche dell'UNHCR, una persona per ogni 113 è sfrattata dalla sua comunità a causa di conflitti, con il risultato che ad oggi si registra il maggior numero di richiedenti asilo nella storia. Situazione che lascia queste persone in uno «spazio giurisdizionale grigio» che il bando molto esplicitamente identifica fisicamente con i «centri di detenzione». E qui la chiamata del concorso agli studenti di architettura: «come si può guardare alla progettazione di un centro di detenzione - un luogo non esistente tra l'immigrato e la cittadinanza - per umanizzare architettonicamente questo spostamento»? Ovviamente, come l’autore dell’articolo spiega, la scelta delle parole, ambigue e non troppo forti, non è casuale. Qui link al sito di The funambulist. The Association of Collegiate Schools of Architecture (ACSA) is currently organizing a design competition for architecture students in the United States and Canada in partnership of the steel lobby represented here by the American Institute of Steel Construction (AISC). As usual, in this kind of partnerships, the lobby’s product does not solely constitute the main element that is required to be used in the designed projects, it is also ‘generously’ promoted by the ACSA in a paragraph entitled “Advantages of Steel” that ratifies the ambiguity between the neutrality they are expected to manifest in a brief not explicitly characterized as an ad space and the sponsorship of a material lobby. Although there would be a lot to write about these practices, the subject of this article is elsewhere. "The Opportunity: challenges architecture students to create a more humanitarian design of a Detention Center by emphasizing family and community rather than isolation. Steel offers great benefits in this endeavor, as it allows for longer spans and more creative light filled spaces." These two lines of brief are then followed by an online page describing the specifics of the competition. 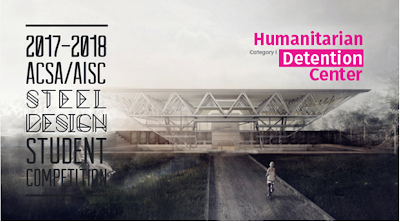 The first sentence is eloquent: “The Steel Competition seeks to understand the potential of an architecture of alterity by positioning a third-space between difference and the same by redefining ICE, or an Immigration and Custom Enforcement Facility to create a more Humanitarian Design of a Detention Center” (my emphasis). Language is important and the idea of creating a position that would neither be “different” or “the same” appears as a symptom of what Orwell calls “newspeak” in 1984 (1949): the encompassing of all truth discourses in one sentence to deactivate language’s signification and enforce the status quo. It is important to understand that the extreme ambiguity of language here (“a nonplace […] between […] difference and the same,” “architecturally humanize displacement”) is less due to the poor writing skills of the brief’s authors and much more about the way the packaging of the information is made to erase the complicity of architects with the program itself and made them feel instead as humanitarian workers, whose role is not to question the structure in which they operate, but rather propose a punctual help to those who experience its violence. The terms of structure should however invite us to think otherwise, as this term belongs to the lexical field known of architects. 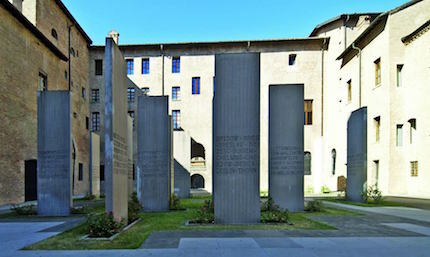 However, if we do not limit the definition of architects to the narrow understanding of a diploma-sanctioned profession, but rather extend it to all actors whose technical expertise in terms of space organization is mobilized to materialize the spatial order we call a building, we can see how political programs of this kind could not be implemented (durably) without their contribution. Architects’ general capacity for outrage is a somehow laudable one, and we’ve seen it when the American Institute of Architects (AIA) only waited a few hours after the current US President’s election to declare its will to work in concert with his administration (see past article), or when architects were consulted to build the rest (many seem to forget that a third of it already exists!) of the militarized border wall between the US and Mexico; yet, the formulation of the outrage is at least as important than the outrage itself. Too often, this formulation occupies the space Western ideology leaves on purpose to its own critique in order to gain more legitimacy, and therefore ultimately reinforces that against what it claims to be fighting. As always when it comes to the architects’ contribution to carceral facilities, the question should be less about whether or not they should accept such commissions than to examine the ways through which architecture is almost always exclusively materializing the social order in which the carceral condition is not simply a part but also an unsurpassable dimension. But this competition does not just allow us to wonder about architects’ responsibility in the enforcement of this social order; it also inadvertently allows us to ponder on what is humanitarianism. 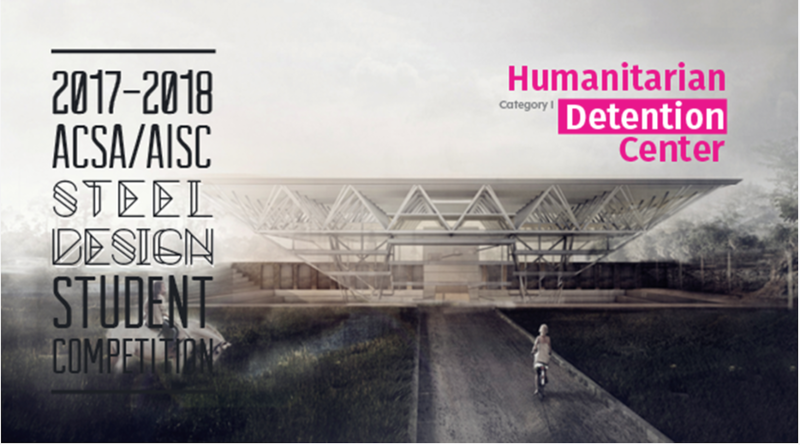 The very notion of “humanitarian Detention Center” that constitutes the explicit program of this competition could indeed appear to many as a contradiction in itself, a detention center being, by definition, at odds with the notion of humanitarianism. I however would like to insist that not only there is no contradiction contained in the association of these terms, but that the latter even expresses the core of Western militarized humanism. Humanitarianism does not consists in a political struggle against the violence of its structures. Rather, it claims to embody an apolitical position that mitigate this violence when, in fact, it makes this violence disappear from regimes of visibility, legitimizes it, and ultimately reinforces these structures to which it is fully part of. What these considerations for architects and humanitarians only leave as tenable option, is their contribution to the dismantlement of the social order and its violence that they materialize. In this regard, solidarity with political movements that aim at abolishing all forms of carceral institutions constitutes a good start.